A wide angle lens is often a great one to have. If you love shooting landscapes or prefer to shoot architecture, you will need to have at least one good wide angle lens. They are also great for wedding shots when you need to compose a group shoot fitting the entire extended family in a single frame. There are moments when a wide angle lens becomes an absolute life saver such as a tight area where you don’t have room to step back and maneuver. 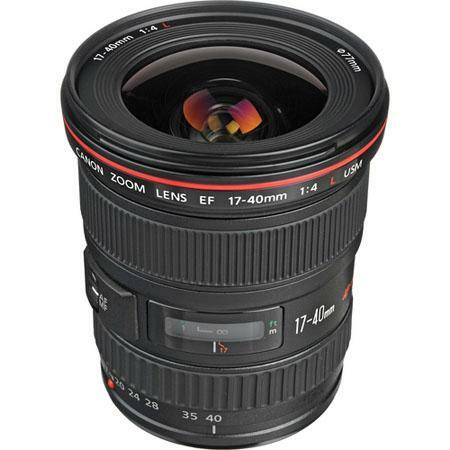 At 17-40mm focal length range the Canon EF 17-40 mm f/4L USM is a great lens to have. At only $840, it is certainly not going to break the bank to afford and should give you wonderful moments of joy while using the ultra wide angle lens. 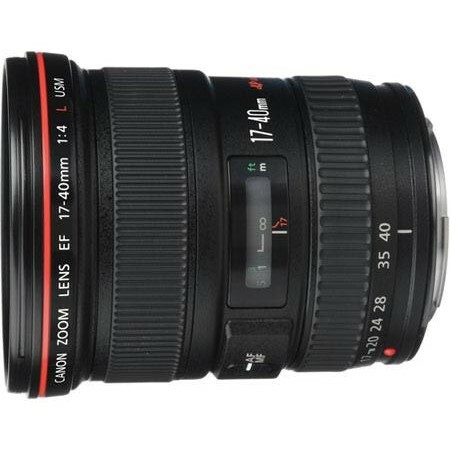 The Canon EF 17-40 mm f/4L USM lens has a 77mm thread specification. That means when purchasing filters for this lens one has to look for 77mm as the diameter of the filter. The lens elements are non extending meaning when you turn the focus and or the zoom rings, the elements do not move outside the lens barrel. This is also known as internal focusing. Another advantage of a non rotating barrel, especially when you’re into using circular polarizers and neutral density screw-on filters, is that the filter does not rotate and lose its orientation. Once you have dialed in the circular polarizer or the variable neutral density filter, turning the focusing ring or zoom ring will not affect them any further and your final shot will be exactly as you have seen it through the viewfinder. However when buying a polarizing filter or a neutral density filter you should opt for one that is slimmer than usual to avoid aggravating the problems of vignetting. Being an ultra wide angle lens, the 17-40 mm suffers from vignetting at its widest aperture. Wide angle lenses suffer from problems with light dispersion because of the different angles at which refracted light waves are split into after passing the lens glass. As such after passing through the lens glass different colors travel in differently and converge at different focal planes creating images which appear with overlapping colors at the fringes (color fringing). Lens manufacturers use different systems in order to correct this problem. But glass only has a limited capacity to correct this problem of dispersion. Canon first started experimenting with a material called fluorite back in the 60’s. The result was the creation of the first artificial fluorite lens elements. Unlike standard glass lens elements, which have but only a limited success in stopping dispersion, fluorite can vastly control axial chromatic aberration and thereby reduce color fringing. The Canon EF 17-40 mm f/4L USM does control chromatic aberration to a large extent; however it is not completely suppressed. Once you zoom out to 24mm or less, some chromatic aberration can be noticed specially where the edges of dark structures meet light colored backgrounds. Stopping down to a lower aperture or zooming in can reduce this problem significantly. 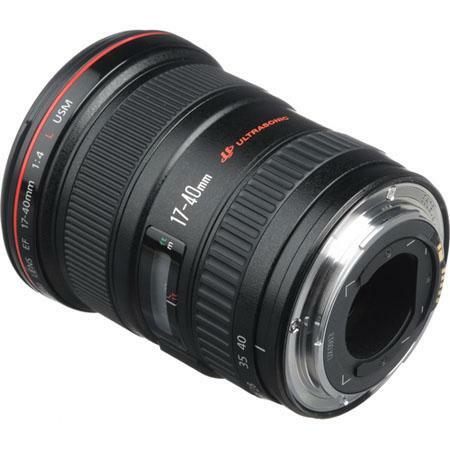 The Canon EF 17-40 mm f/4L USM lens has Ring Type USM. This means it is really fast when auto focusing and ensures quicker composition. There are two distinct types of USM (UltraSonic Motors) provided by Canon in its lenses. The L series lenses usually have the RingType which is faster and quieter. Comparatively the MicroMotor type USM has a pronounced noise when focusing and even the focusing is not that fast. Usually wide angle lenses have a larger aperture, but the 17-40 mm starts at f/4 which makes it reasonably sharp even at wide angles. The trade off is one can expect only a little bit of bokeh when shooting at f/4. The EF 17-40 mm f/4L USM lens is weather sealed. However you will need to screw on a UV filter to be able to complete the sealing. Without a UV filter do not attempt to get the lens wet. Canon’s L series lenses use state of the art glass and optical technology and the EF 17-40 mm f/4L USM lives up to those standards. Wide open or at fully zoomed in the 17-40mm does offer some very sharp images. As expected for wide angle lenses, when really wide open not the entire image (corner to corner) is sharp. Low lights will need more shutter speeds and without an IS system it should pose some problems for users to shoot while handholding the camera. Vignetting is a problem if you mount the lens to a full frame body. At wider F stop there are going to be noticeable problems of vignetting as is expected with any lens as wide as this. However if you stop down and or even zoom out or use the lens on a cropped body (APS-C or APS-H) the problems of vignetting will be missing. 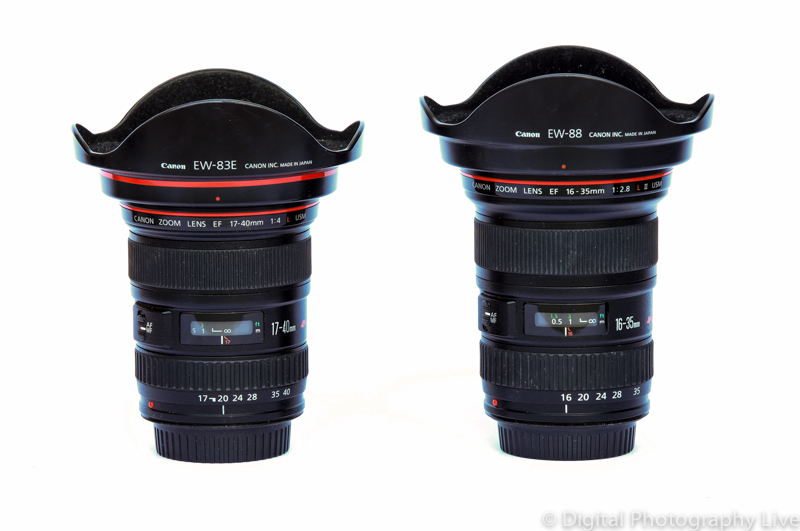 Comparing with the Canon EF 16-35mm f/2.8 L II lens: is it a good buy? Canon’s EF 16-35mm f/2.8 L II lens is something that comes very close to the Canon EF 17-40 mm f/4L USM in terms of focal length. But there is a considerable amount of price gap between the two that makes the price of the 17-40mm only half of that of the 16-35mm. The trade off however is the maximum aperture. While the 16-35mm is f/2.8 at its widest the 17-40mm is f/4 making it considerably slower. Again the 17-40 mm suffers from the lack of an IS system. This means when shooting at slower shutter speeds you will need to have a tripod to be able to steady the shot. Handholding at slower shutter speeds can be a problem; especially when you don’t have steady hands or the conditions are windy. The weight of the lens is around 500 gms which makes it slightly lighter than the Canon EF 16-35mm f/2.8 L II lens (at 640gms). In spite of all that shortcomings, the lens is well built and should hold out even in the most trying of conditions. 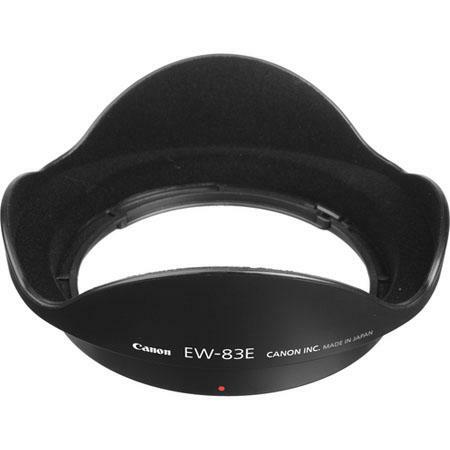 If you really want a cheaper wide angle lens that is part of the Canon L series then this is a good choice to go with.